Every mother knows the power of a healthy home-cooked meal; mothers have been feeding their families since time began. They’d gather a variety of proteins, starches, fruits, legumes and vegetables and wave their magic wand (or wooden spoon) and voila—the perfect meal. They were like super heroes to their families, saving the integrity of nutrition, one serving at a time. Nowadays, we moms are so busy keeping all the balls in the air, it’s a wonder we have time to cook at all. But with a little knowledge, you can keep the nutrition on your family’s plate while still having time to juggles those balls. The secret? Super foods! There are plenty of super food lists out there, but most families have not experienced the most exotic, touted versions like goji berries or acai—nor do you need go to exotic extremes to experience true super foods. To keep the “super-ness” of our list to more common, everyday, attainable foods, we’ve gone to the local grocery for inspiration. (Not to say, the exotic super foods aren’t “super,” but for this list, let’s keep it closer to home). When you add these simple foods to your daily meals, you’ll see improved health, more vibrancy, better digestion and improved metabolism. Always remember, to check with your doctor before trying any new eating plan and never self-diagnose or self-medicate—even if with a food or herb. There really is magic in the foods on your plate. The right foods can heal, make you feel wonderful and taste delicious, while still keeping excess calories and unhealthy fats out of your diet. Next time you’re at the grocery store, gather up some of the foods on this list and rest assured, you’re loving your family up with every bite they take! Lately, some critics have given nuts poor marks, because they’re high in fat. What you should know is, calorie-for-calorie and in small doses, nuts are high in protein, fiber and antioxidants. The trick is to use them in recipes and other dishes. Use nuts as a salad topper or even ground up in your meatloaf. For a snack, give an ounce (one small handful) of almonds, walnuts, pistachios, peanuts or pecans a try. Package up small servings of nuts in reusable plastic bags or containers to keep some “super” with you all day long. According to Jessica Fishman Levinson, MS, RD, CDN, Registered Dietitian and founder of Nutritioulicious.com, Nuts are full of nutrients, including healthy unsaturated fat, fiber, protein, and antioxidants. When it comes to choosing nuts, go with unsalted varieties and limit the portion to a small handful at a time – remember, a little bit goes a long way. Beans are incredibly healthy for your heart and cholesterol levels. They pack a whopper punch of soluble and insoluble fiber to keeps things “moving” (think flat belly in time for summer) and they seriously fill you up. They’re loaded with protein and necessary nutrients and can certainly stand in for a main course or as an added kick to any side dish. Sprinkle some on top of your salad to feel satisfied and eliminate mid-day cravings. The U.S. Dietary Guidelines recommend 3 cups weekly. According to Levinson, Beans are a great source of folate, a B vitamin that has been shown to reduce the risk of cardiovascular disease and is also necessary for women of childbearing age to promote proper cell development during the early stages of pregnancy. Canned beans can pack a lot of sodium, so look for unsalted varieties or rinse them before eating. Every super mom wants super looking skin, and this super food is just the ticket. Wild salmon, a cold water fish, provides one of the richest dietary sources of age-defying, anti-inflammatory (disease fighting) omega-3 fatty acids and the antioxidant, astaxanthin you can consume. It enhances healthy blood-flow, which gives your skin a natural glow and it supplies essential fatty acids (EFAs) which are necessary for all your parts to keep working smoothly (think oil for your car—you need it) and to ward off disease. The American Heart Association website recommends eating fatty fish like salmon twice weekly for a good source of protein and good fat. Greens like, kale and spinach are the key to a adding a host of antioxidants and nutrients into your day. Greens offer more nutrition per calorie than any other food and are loaded with carotenoids, which can actually increase the elasticity of your skin. It’s almost a no-brainer how important greens are to your diet, but we often neglect these foods altogether. If you’re not a fan of greens, try working them into a delicious smoothie. Combine apple juice, a frozen banana, ¼ cup of blueberries (more on those little guys later), a tablespoon of ground flax seeds and one leaf of kale or small handful of spinach. When you combine it all together in your blender, you won’t even taste the greens (nor will your kids). You’ll get a super sweet treat and healthier skin as a side benefit. For maximum benefit, add a mixed green salad to your meals every day. As a super food, blueberries are loaded with vitamins and minerals. Fresh or frozen, they carry a rich variety of anti-wrinkle antioxidants and anti-inflammatory phytochemicals, leaving skin vibrant and supple and your waistline looking svelte. See the above smoothie recipe for inspiration, add some to the side of your next meal, or grab a handful as a snack. It’s as easy as that! 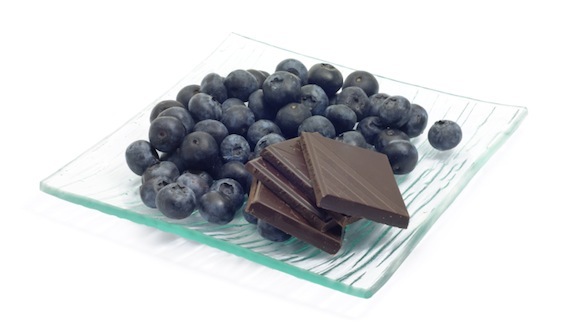 That’s right: chocolate IS good for you—when you consume the healthy version of the stuff. Many studies suggest that cocao, which comes from a plant, is rich in powerful antioxidants. It’s got eight times more flavanols than strawberries (flavinols are anti-oxidants that, according to the Cleveland Clinic, protect the body from the effects of aging). These can relax your blood pressure and help balance your hormones. The best part? Chocolate puts a smile on your face while you’re eating it. Always choose dark chocolate that’s at least 70 percent cocoa, to steer clear of the unwanted fat you’ll find in garden variety milk chocolate. There is plenty of evidence out there that starchy, bleached white flour is not the best source of nutrition for your family. But rest assured, there is a grain out there that loves you, gluten issues, or not. Let us introduce you to a grain that shares shelf space with rice at your local grocery: quinoa. This ancient little circular grain is filled with iron, quick and easy to prepare, and is ramped up with about 8 grams of protein per one cup of cooked grain. Vegetarians can’t get enough of it. It helps your maintain your weight and tastes great tossed with diced chicken, veggies or even as a hot cereal with a spot of honey and cinnamon. “What’s great about quinoa is that it is the only grain that is a complete protein,” says registered dietitian, Jessica Levinson. “This means it has all of the essential amino acids (protein building blocks) you need.” Unlike rice and beans, two incomplete proteins that are often served together to make a complete protein, quinoa can be eaten alone. This is great for vegetarians who don’t eat any animal proteins. Eggs are our friend. They are little protein-filled multi-taskers in their own little carrying case, ready to be used in recipes, hard-boiled, cooked up or scrambled for our delight. Loaded with vitamins and minerals, eggs rank high on the list of go-to healthy super foods. This secret little seed is heaven sent. “Inexpensive, loaded with Essential Fatty Acids, fiber (flat belly food) and easy to use, flax fits the bill,” says Bonita Kindle, Certified Health Counselor and founder of Rawfoodsandfitness.com. Try grinding these tiny seeds in a coffee grinder (one designated just for seed grinding-no coffee, please) and added a tablespoon to your smoothie (see recipe above) or atop your salad. Super seeds to the rescue! Your teacher was right — an apple a day can keep the doctor away. Eat an apple before your meal and you’ll most likely eat less unhealthy options at mealtime because they’re high in fiber, helping you fill up faster. Apples are also known to help prevent metabolic syndrome, a condition connected to extra belly fat (known as the apple shape). The pectin in apples aids in lowering the LDL (bad) cholesterol, and defends against many cancers. Apple your pie, your kid’s lunchboxes, anything, just eat them!